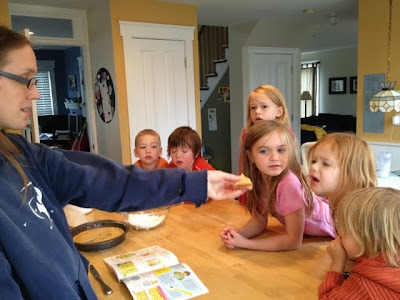 Lori, her kids, and Kacki came over today to continue our group journey through Science in the Kitchen , one of the science books we're going through this year with My Father's World. 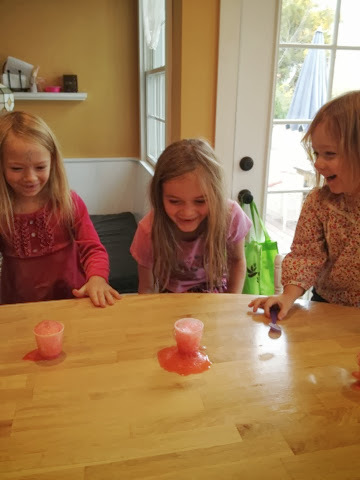 Hands-on experiments are always more fun with your best friends. 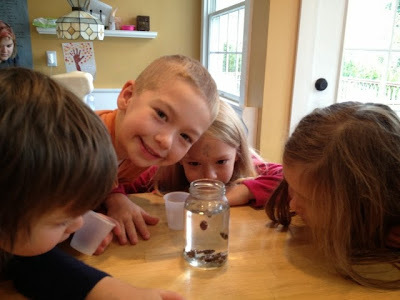 The bubbles clung to the raisins and carried them to the surface, where they popped and dropped the raisins back to the bottom, repeating the process all over again. 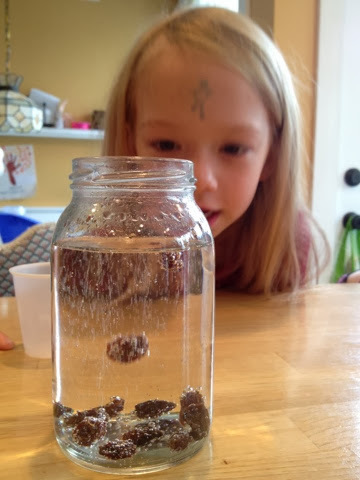 It was super cool to watch, and I think the grown-ups and kids alike could have all sat there staring at the jar, making predictions on which raisin would take flight next, for a good long time...like it was some kind of lava lamp. Next, we made our own fizz. Each kid got a cup with a little vinegar and one drop of food coloring. 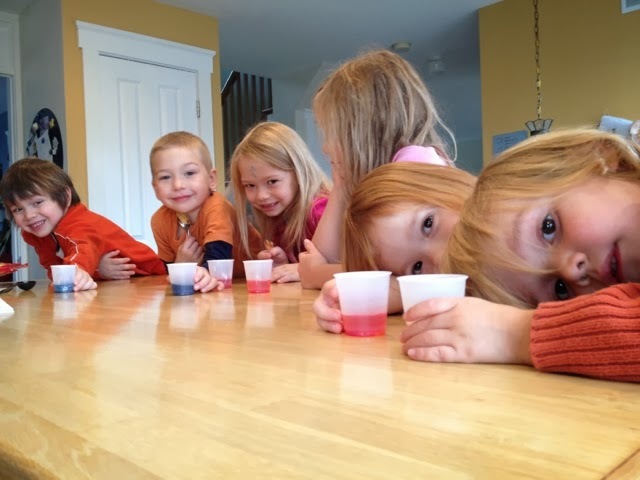 After a few kids (mostly Jacob) somehow managed to spill colored cups of vinegar all over the counter...repeatedly...all the kids did an impressive job patiently waiting until each person had a spoonful of baking soda. Then on the count of three, they dropped their spoonfuls into their cups at the same time. Their cups runneth over! I was super surprised the reaction was so big and so immediate. Just like with the Sprite and the raisins, I was as excited by the results as the kids! 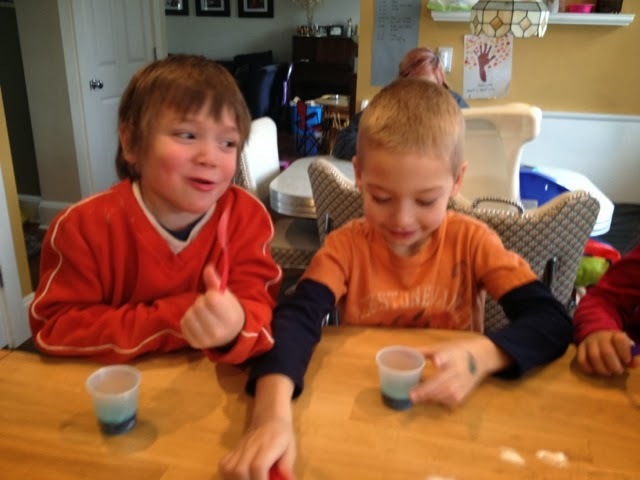 I believe it was Jeffrey who postulated that perhaps blue food coloring hindered the reaction more than red food coloring, which was why the boys' cups did not fizz as high as the girls' cups. Hmmm, if anyone has any scientific evidence to support that clever theory, I'm all ears! 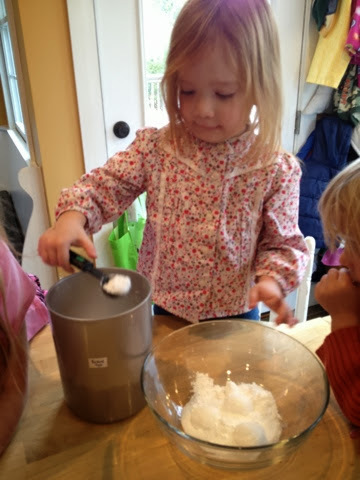 For our third experiment, the kids mixed one part baking soda and one part citric acid with eight parts powdered sugar. 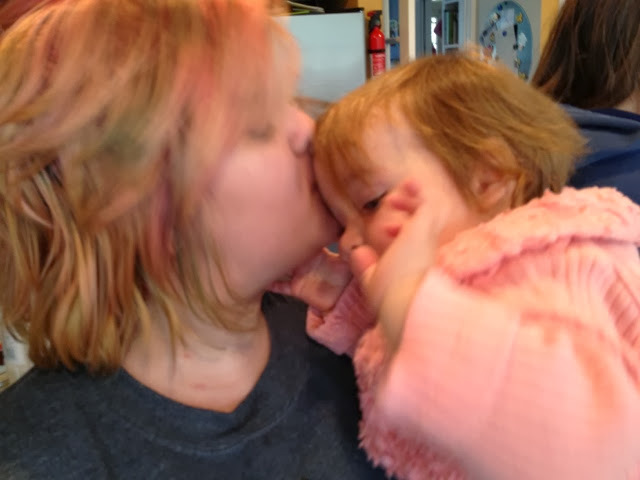 This time, the reaction could not be seen, but when moistened - on the kids tongues! - it sure started to fizz! I wish I got a picture of some of their reactions. Some of the kids thought it was great fun bubbling away in their mouths. A couple others (namely Lily and Sam) realized, "Hey wait a second. This is not so pleasant," and presently ran over to the garbage to spit it out. Hah! The grown-ups tried it next and we all thought it was pretty cool - like homemade Pixie Stix or Pop Rocks. Perhaps even like Alka Seltzer, which also seems to activate once wet. Lastly, we took a look at the bubbles in the yummy pear torte that Kirsten made early this morning and brought to share with her fellow scientists. Mmmm...every science time should end with homemade goodies! 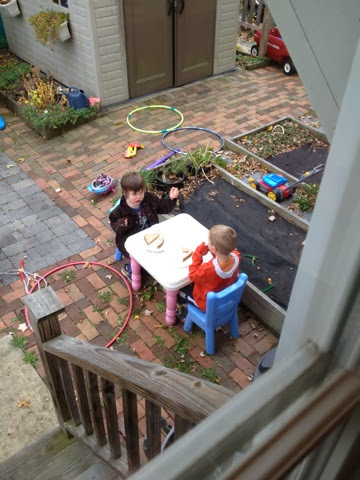 Two little boys who love each other very, very much, making the most of their post-science lunch break. 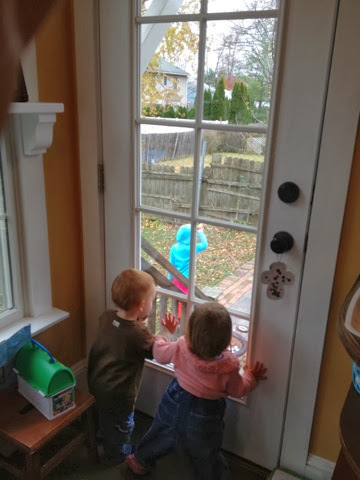 After little tummies were full, we headed outside (despite the cold!) for a gym lesson from Family Time Fitness. Although there is no photographic proof, I'm here to tell you there was much skipping and hopping and relay-racing and hula-hooping. And teeth-chattering. And two sweet little ones who very much wished they were just a little bit bigger.